If you’re like most iPhone users, you and your smartphone are pretty much joined at the hip. As useful as your iPhone is, it can’t cut a pesky tag off your shirt, tighten a loose screw on your glasses, or sign your John Hancock for you—or can it? An 8-in-1 multi tool, the IN1 Case contains: A blue or red pen, Phillips screwdriver, flat-head screwdriver, kickstand, nail file, tweezers, scissors, and a toothpick. Music executive Shervin Azodi came up with the idea for the IN1 Case while searching for a pen to sign a big record deal. As always, he had his iPhone in his pocket. But, there were no writing utensils easily within reach. Made of a tough polycarbonate to help protect against dings and dents and featuring a felt lining to prevent the case from scratching the surface of your iPhone, the IN1 Case is easy to put on and remove. But since the case is TSA compliant and so handy to have around, we think you’ll find that there’s really no reason to take it off. We started IN1 Case to make your smartphone even smarter. Our case has a bevy of tools that are aimed to be helpful with everyday tasks. So whilst the IN1 case won't assist you in removing and rebuilding a gearbox from a 1985 GMC Pacer or help you slay, skin and cook a wildebeest, they will help with day to day tasks such as writing notes and cutting open packages. We believe you should "demand more from your case," and hope you agree! I love the idea, but I was wondering if it passes airport security or do you have to remove the case when you only travel with a carry on bag. Aaron from The Grommet here. Yes, the case is TSA compliant! We've had several testers take it through airport security with no problem. You can simply leave it on your phone. No need to take your phone out. If there was a place to slide an ID card, debit card, and a little cash it would be ultimate case! Very inventive with lots of great tools! Would a card slip inside the case with the phone? That's a good idea! Unfortunately, the current case is not designed to hold any cards (and will not fit if you try and put a card between the phone and case), but we'll certainly pass along the notion to IN1 Case. This is a great idea. We played around with the idea, but it doubled the thickness of the case. Hi is this available for iPhone4? Hi, IN1 Case only offers an iPhone 5/s version at this time. @Aaron I really like my 4s. Can a version be made? IN1 Case is currently developing cases to fit additional phones, so the iPhone 4 may be in the works. I love this. In terms of "demanding more from your case," any plans for making a waterproof version? That's the version my husband wants. Or a version with similar utility to the EYN case for carrying credit cards, license, etc? That's the version I want. Those are all excellent suggestions. I know IN1 Case has many plans for future products, so they will certainly take your ideas into consideration! Love the idea! Can the case clip onto my pocket or belt? It will be difficult to clip the case onto your pocket or belt. The case does not come with a clip or have a hole to easily attach a wristlet to, unfortunately. Wow! Now I have to go buy a smart phone. Question: What about the metal tools...are they also TSA compliant? You can find the list of tools if you click on the product image. This will take you to the product page and lists out all of the details. Yes! The case and all of the tools are TSA compliant. Unfortunately, IN1 Case only offers an iPhone 5/s version at this time. What is the thickness with and without the phone? I need to fit it in my clip on holder. The phone is 0.6" thick and encompasses the phone so it is no thicker with the phone inside. You can find the whole case dimensions in the product details (if you click on the image of the phone). IN1 Case is developing many new cases, so Samsung may be a future offering. Stay tuned! Will this case work on the iphone 5 or does it only fit the iPhone 5/s? This case fits with iPhone 5 and 5s. I think this is a great idea, but for TSA purposes, you say that you have had testers carrying it through airport security, but has the TSA approved it? Yes, the case is TSA approved. @Aaron, @Mike -- Hi! I'm one of the testers who took the case on flights through Boston, Toronto, Vancouver and Minneapolis airports this month. Security was thorough and did not question the case. I was happy to have the pen for the Customs forms, and used the scissors in flight to cut a pulled thread from my daughter's backpack. do you make one for a 5c? Unfortunately, the case only works with the iPhone 5/s and they do not currently offer a case for the iPhone 5c. @Aaron Do you think you might? Hi Heather, I'm not sure of what IN1 Case plans to offer in the future, but let me find out. Love the idea, is this case targeted to woman only? 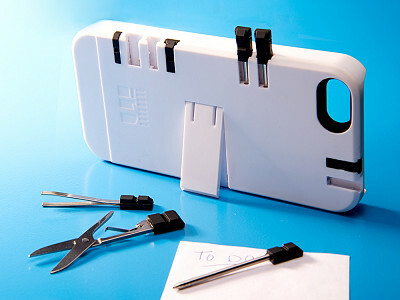 This case is designed for anyone who needs a few extra tools on them at all times, just in case! If you’re like most iPhone users, you and your smartphone are pretty much joined at the hip. As useful as your iPhone is, it can’t cut a pesky tag off your shirt, tighten a loose screw on your glasses, or sign your John Hancock for you—or can it? 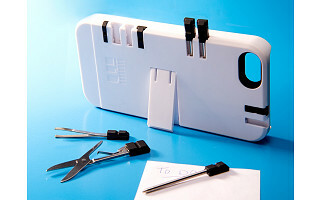 An 8-in-1 multi tool, the IN1 Case contains: A blue or red pen, Phillips screwdriver, flat-head screwdriver, kickstand, nail file, tweezers, scissors, and a toothpick. 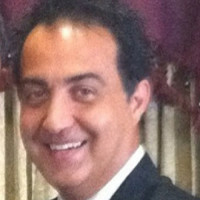 Music executive Shervin Azodi came up with the idea for the IN1 Case while searching for a pen to sign a big record deal. As always, he had his iPhone in his pocket. But, there were no writing utensils easily within reach.